To support Yokogawa's position as the world's foremost supplier of power analyzers and meters, Yokogawa Europe offers leading calibration capabilities from its ISO 17025 accredited European Standards Laboratory in the Netherlands. A wide variety of Yokogawa's products can be calibrated. ‘Calibration' is the comparison of an instrument's performance with a standard of known accuracy. However all laboratory and even national standards have uncertainties of measurement, hence it is impossible to be 100% confident that an instrument is operating within its stated tolerance limits. Regular calibration by a laboratory, which can provide very low measurement uncertainties at the specific measurement points applicable to you, enables you and your customers to have confidence in your test results. For example, a power calibration at only 50 or 60Hz has little value. 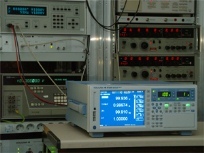 Calibration of high-frequency power has lagged behind the development of power meters to address these applications, and few national laboratories can provide traceability up to 100 kHz: the frequency at which instruments have to be calibrated to provide accurate results in these application sectors. The guaranteed accuracy and precision of Yokogawa's instruments results from the fact that Yokogawa has its own European standards laboratory at its European headquarters in The Netherlands. This facility is the only industrial (i.e. non-government or national) organisation in the world to offer accredited power calibration, at frequencies up to 100 kHz. ISO 17025 accreditation demonstrates the international competence of the ISO 17025 accreditation demonstrates the international competence of the laboratory. For calibration enquiries, please call us or fill in your details here and we will get back to you. No measurement is ever correct. There is always an unknown, finite, non-zero difference between a measured value and the corresponding ‘true' value. In other words, a user can never be 100% sure that an instrument is operating within its specified tolerance limits. However, there are steps that can be taken to minimize the possibility of a measurement falling outside specified tolerance or uncertainty bands. Regular traceable calibration is a method for gaining quantifiable confidence in a measurement system by comparing the instrument's performance to a standard of known accuracy. It is important to understand the difference between ‘calibration' and ‘adjustment'. Calibration is the comparison of a measuring instrument (an unknown) against an equal or better standard. A standard in a measurement is therefore the reference. Instruments are adjusted initially at the factory to indicate a value that is as close as possible to the reference value. The uncertainties of the reference standard used in the adjustment process will also dictate the confidence that the indicated value is ‘correct'. As the instrument ages, the indicated value may drift due to environmental factors (temperature, humidity, oxidation, loading etc.) which will also be dependent on the quality of its design and manufacture. To ensure that the instrument continues to operate within the manufacturer's tolerances, the instrument should be compared to the reference value on a regular basis (usually annually). If necessary, the instrument can then be re-adjusted. The scope of our calibration can be downloaded here. It shows the details of the specific quantities which are covered, their specific measuring ranges and their corresponding measurement uncertainties. Yokogawa products which can be calibrated therefore include. Specifications alone do not guarantee actual performance. Accuracy figures quoted in manufacturers' specifications - and indeed some of the parameters listed in calibration certificates issued by well-established test houses - can be meaningless when taken out of context. Traditionally, AC power meters have been calibrated at frequencies of 50 to 60 Hz. However, the reason that Yokogawa and other power meter manufacturers offer instruments with much higher power measuring bandwidths is that most applications consume power at higher frequencies. There is therefore a question mark over the validity of the specifications of a power meter or analyser. Yokogawa's European Calibration Laboratory is the only industrial (i.e. non-government or national) organisation to offer traceability up to 100 kHz, and thus is the only power meter manufacturer which can directly prove the performance of its own instruments. Only a Yokogawa Calibration Certificate gives the user trust in their instrument's measurements. No measurement is ever "correct". There is always an unknown, finite, non-zero difference between a measured value and the corresponding ‘true' value. In other words, a user can never be 100% sure that an instrument is operating within its specified tolerance limits. Regular accredited calibration is a method for gaining quantifiable confidence in a measurement system by comparing the instrument's performance to a standard of known accuracy. Calibration of external current transducers at currents of up to 1200 A with very precise phase calibration to cater for the measurement of power as well as current. Calibration at low power factors down to 0.001. High accuracy power calibration for frequencies between 45 and 60 Hz using a sampling wattmeter with uncertainties less than 30 parts in 106 for active, reactive and apparent power. Calibration of instruments such as: digital multimeters, oscilloscopes, ScopeCorders, data loggers, recorders, calibrators, frequency counters, communication testers, optical spectrum analyzers (OSA), optical time-domain reflectometers (OTDR). Certificates are supplied which include measurement values and the result with reference to the manufacturers specifications. Tailor made calibrations are available according to customer's specific requirements. Here are some sample certificates for Yokogawa test and measuring instruments. If you would like a sample certificate for an instrument which is not shown, please send a request to CSC.calibration@nl.yokogawa.com. A detailed sample report with calculations on how Yokogawa WT310 digital power meter not only fulfills the requirements of the recent IEC 62301 Ed. 2.0 and EN50564:2011 international standards but also exceeds those by far. meters from DC, 10 Hz up to 100 kHz. To evaluate the calibration system traceability, a bilateral comparison was carried out between the Yokogawa European Standards Laboratory and the National Standards Institute of Sweden (RISE). gives the user trust in their instrument's measurements. Yokogawa participated in an official Interlaboratory Comparison on low frequency (LF) power. Different accredited laboratories measured an object (a power meter) and the results were compared to reference values. The different laboratories are not shown by name, however the Yokogawa European Standards Laboratory is described as ‘L002'. Two conclusions can be made from the document. The Yokogawa WT3000 power analyser is proven to have the required accuracy, stability and ruggedness to enable it to be used as the measurement object in this interlaboratory comparison. The Yokogawa European Standards Laboratory has the best stated uncertainties which are thus better than the National Standards laboratory (VSL) in this document. A detailed sample report with calculations on how Yokogawa WT210 digital power meter not only fulfills the requirements of the recent IEC 62301 Ed. 2.0 and EN50564:2011 international standards but also exceeds those by far. A high accuracy power measurement system, based on digital sampling techniques, is being developed at the standards laboratory of Yokogawa in Europe. The system is based on two sampling voltmeters and a synchronization device. Using potential transformers and compensated current transformers with an AC shunt resistor, the uncertainty is less than 20 ppm for active, reactive and apparent power for frequencies between 45 Hz - 60 Hz.